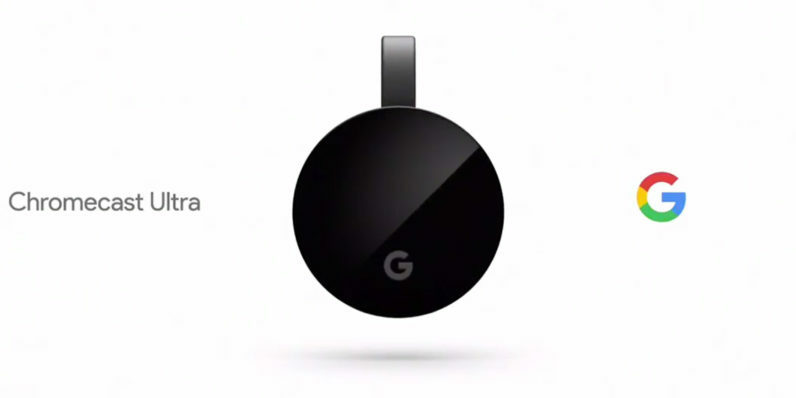 At its hardware launch event in San Francisco today, Google unveiled its new Chromecast Ultra, a streaming dongle that pairs with your phone and plugs into your TV to deliver 4K video content over the Web. The successor to last year’s second-gen Chromecast also support high dynamic range (HDR) and Dolby Vision output, so you should see improved contrast and lighting effects in videos. The new device sports a hockey-puck-like body similar to the previous version, but does away with the Chrome branding. Plus, it has an ethernet port integrated into the power adaptor for increased connectivity options. Google says it’s also 1.8x faster than the previous edition and offers improved Wi-Fi performance. Plus, it can be controlled hands-free when paired with the company’s Home voice-activated hub; you can fire up YouTube and (soon) Netflix content just by asking for whatever you want to watch, or check out photos from your library. The Chromecast Ultra will become available in November for $69 – about double the price of the last Chromecast. That’s a hard sell, given that the only real upgrade that the Chromecast Ultra brings is higher resolution output. For that price, you can score Xiaomi’s new 4K-capable Android TV-based streaming box, which not only includes a full OS that supports a range of interactive apps, but also comes with a handheld remote that accepts voice commands. Google noted that it’s sold more than 30 million Chromecast devices since they first launched. It’ll be interesting to see how the latest one does.